fwiw mine were still a tad waxy to the feel before the rain that followed my last feel, hope to find em papery AND DRY tomorrow, will keep fingers toes and all else crossed in the meanwhile. Not a bumper crop, but a crop nonetheless from plants that looked like they were dying off last year (year #2) (heavy clay soil .. so expectations have always been limited, though i may consider repoting one if i can find a suitable container?? I'd better get my new rootstock planted, its still in the fridge..! Nice! What variety are they? My First Gold have started too, they are always earlier than the rest. These are first gold, planted last year. They didn't really produce many hops last year - although I didn't cut back weaker bines or fertilise them so hopefully this year will be better. Would it be too late to plant hops now? HTH1975 wrote: Would it be too late to plant hops now? As long as you can still get hold of a rhizome, then it's not too later. you might be able to get a plant that's already started shooting this year. Base dipped in rooting powder and a little gentle bottom heat if available. I put mine on my grain bed compost heater. My Cascade and Chinook have a good crop which already seem to want harvesting. Very early! You pass the forum criteria so there shouldn't be a reason why you can't. For drying you need a shaded area, a fan and some appropriate netting to hold them in. Keep the hops spread in a thin layer so they dry quickly with the fan providing circulation. Once dry, vacuum seal and freeze or use asap. I tried a dehydrater but wasn't impressed, will keep that for other uses. Using wet is also an option, you don't necessarily get an overly grassy beer. I made one recently with fresh Chinook and Cascade, it's very piny and resinous not grassy. It's usually best to bitter with a know Alpha acid hop and use your own hops at flameout. Shredding the hops before adding also seems to improve the extraction of oils. xie xie nee jkp. Mrs B's eyes nearly popped when I said the plant hanging up the side of our house had to fit into the airing cupboard. Its grown 2 stories in its first season and is at the guttering of the roof via the drain pipe. (its a cascade from willingham nursery). I dried 2 tea trays full 3 days ago so will do another load. Im trying to leave harvest as late as possible to increase lupilowhatsit content. A few cones are getting an orange tint so I might have to step it up. Have at least 4 flat tea trays worth to go. So far aromas have not been so floral or citrus, quite noble in fact maybe that will change as cones fully dry, oxidize or whatever else, Ive noticed fresh sage does not taste like dry so maybe my hops will discover thier innner american soon. Lets see what happens. 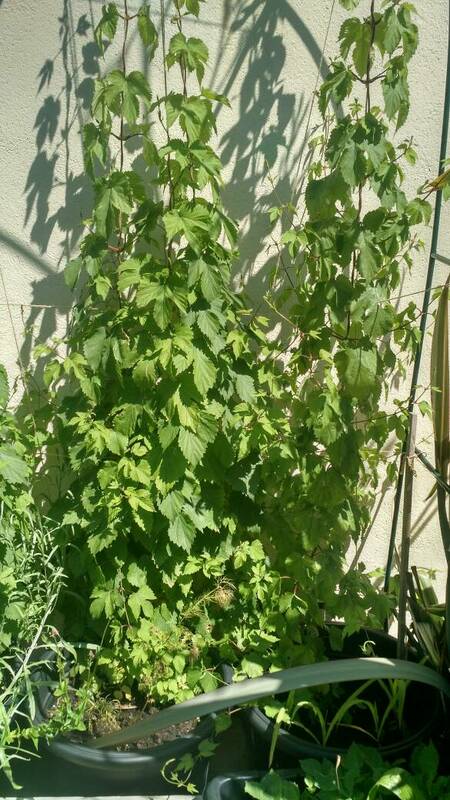 I just spread my hops out on newspaper in the spare bedroom and turn them every day or so. They dry in a few days iirc. I just picked 600g (wet) from a single challenger in its first year, so I'm trying it out at the moment. i have 2 trays 2 drawers and another pile of cascade hops drying in airing cupboard wow hops near top of plant were wonderful. long and fragrant.thanks for everybodies advice, Also went to check some wild hops plants I had my eye on...attention village of Weston...who picked all the hops near the sign to your village. If anyone wants a cascade plants mine will start popping up soon. Ive one in a 30 ltr pot that would need a car to collect. Located near Stevenage.